49.5 MW in Madhya Pradesh and 25.6 MW in Andhra Pradesh. The KN Group strongly believes that it has to give back to society and so, is committed to sustainable initiatives like wind power generation to supply clean and green power to society. The Group has set up five wind power generation units with a total capacity of 10 MW. These windmills are located in the states of Madhya Pradesh, Rajasthan and Maharashtra. - Engaged in erection, installation and associated services for capacities upto 2.1MW Wind Turbines. Wind power is produced by turbines or generators that harness the kinetic energy of wind, turning it into a useful form of energy. The wind is a safe and cost-effective source of renewable energy that produces no water or air pollution. Conductix Wampfler India Pvt. Ltd. Installation of type of electrical appliances and maintenance. - Power saving solution for home, office, shops. - Installation of type of electrical appliances and maintenance. - Electrical Power Houses and Utility Electrical Power Distribution Networks (LV & MV), Lighting and Convenience Power Networks. - Earthing and Lightning protection systems. The Company has two operational wind projects of 1.5 MW each, generating zero-emission grid-friendly power. Since conventional fuel, such as petroleum, coal & gas are depleting day by day, Prakash Industries Ltd. has also opted for the Non-conventional method of power generation i.e. 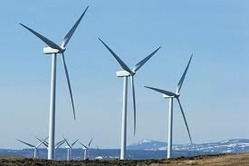 generation of energy from Wind as a step towards conservation of natural resources of the country. Most commonly, wind energy systems generate electricity using large “windmill turbines atop tall masts on high mountain ridges or in exposed locations. Modern wind turbines can vary in size, ranging from small 1000-watt residential units to enormous, 5-megawatt turbines that soar hundreds of feet in the air. Yan Sun Natural Energy Pvt. Ltd.